Know NDHS Class of 1980 graduates that are NOT on this List? Help us Update the 1980 Class List by adding missing names. Our 11th Annual Bulldog Party at Grandpa Tony's. Saturday-October 5th, 2013 at 8:00 pm to ???. DJ and Photographer will be at hand. Brought to you by The Class of 1980. Committee President: Joe Galvan Jr. The Class of 1980 cordially invites everyone to Our 12th Annual Bulldog Party!! Party will be at JPepe's 2720 N.Stemmons Fwy. Dj MRey and Photographer will be at hand! $10.00 at the door. Cash ONLY! Prizes start at the door. 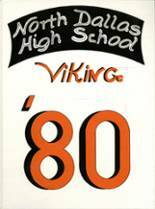 More 1980 alumni from North Dallas HS have posted profiles on Classmates.com®. Click here to register for free at Classmates.com® and view other 1980 alumni. Alumni from the North Dallas High School class of 1980 that have been added to this alumni directory are shown on this page. All of the people on this page graduated in '80 from NDHS. You can register for free to add your name to the NDHS alumni directory.